Heat grill to high. In a bowl, mix the steak strips with the soy sauce and sesame seeds. Thread onto 12 skewers, then grill for 12 minutes, turning halfway through, until golden and sticky. For the salad, mix the vinegar and soy together, then toss with the cucumber, spring onions, chilli and coriander. 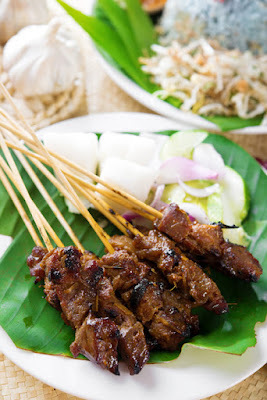 Serve with the beef skewers.